See The Wild Horses of Assateague at the 2018 Spring Pony Roundup! If you’ve ever dreamed of seeing the wild ponies of Assateague Island in person, the first opportunity of the year is right around the corner. The 2018 Spring Pony Roundup is scheduled for April 13th and 14th. The wild ponies of Assateague Island are easily the #1 reason so many people know about and want to visit Chincoteague Island. Marguerite Henry’s popular children’s book, “Misty of Chincoteague,” continues to make that true to this very day. The annual summer Pony Swim draws more people to the island than any other single event. But did you know that’s not the only time you can view the wild horses of Assateague Island? Twice a year – in spring and fall – the Chincoteague Volunteer Fire Company round up the ponies to give the herd an overall health check. The spring roundup also provides an opportunity to release any ponies they’ve bought back from the previous auction into the wild. 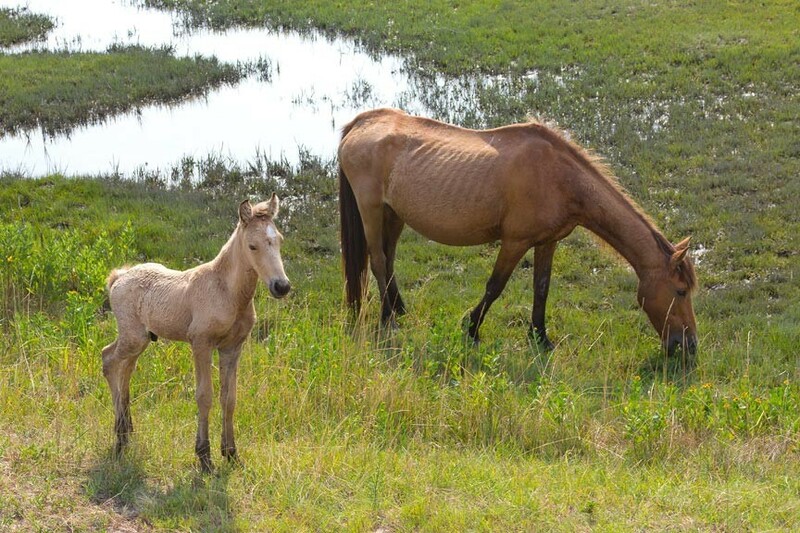 There are two separate herds of wild horses on Assateague Island. Consequently, the spring and fall roundups are split into two days, one for each herd. The southern herd is smaller, closer to Chincoteague, and always the first to be rounded up. The southern herd roundup only lasts a few hours and the pen is right off the road going to the beach on Assateague Island. It is scheduled for April 13th and typically occurs at 5pm. The northern herd is larger and more remote. The northern herd’s spring roundup is scheduled for 8am, April 14th. Anyone wanting to experience this penning needs to be prepared for an early, three-mile hike, one way, up the island’s service road. It’s an easy walk – but a long one for many. If you hope to attend the northern herd’s penning, you need to be prepared for it – and the return journey! Because there’s no pony swim involved in these spring and fall roundups – and because they don’t occur in summer – the crowds are far smaller, the experience more intimate. Further, of the two, the northern herd roundup offers the best experience, if only because it is more sparsely attended. Add in the six-mile hike and you’ve the makings of a great day. No matter which 2018 spring pony roundup you decide to experience, you’re in for an incredible treat. There’s nothing like seeing the wild ponies of Assateague up close! Thousands make the journey every year to see the wild ponies of Assateague – but only a few will enjoy staying at the Chincoteague Island B&B where Marguerite Henry wrote “Misty of Chincoteague! Miss Molly’s Inn Bed & Breakfast is a historic Chincoteague Island B&B offering supremely comfortable rooms, daily gourmet breakfasts, beach gear, and more! Book your stay today!